Cunningham Realty. 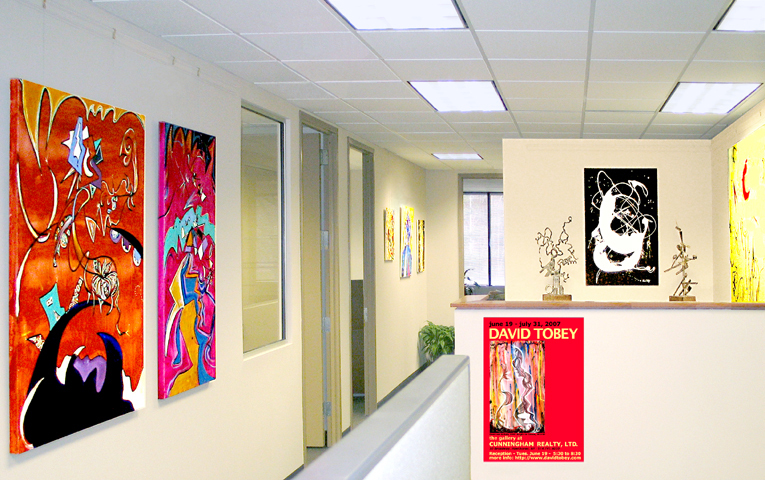 Ltd., in Hawthorne, NY, is hosting an exhibition of over two dozen original paintings, sculptures and prints by artist David Tobey from June 19th through July 2007. David is the son of the noted late illustrator, historical painter and muralist Alton S. Tobey (1914-2005). David has had an extensive career as both a painter and sculptor for many years and shows regularly in New York City one-man and group exhibitions. An opening reception for the show will be held on Tuesday evening, June 19th at the gallery in the Cunningham offices, which are located at 50 Broadway in Hawthorne, NY. Refreshments and entertainment by the Kirk Ehrenreich Duo will be provided, and the public is cordially invited to attend. A one-man exhibition of over two dozen paintings, welded steel sculptures and prints by artist David Tobey, son of the well-known muralist and historical painter Alton S. Tobey (1914-2005) is at a new art exhibition space, The Gallery at Cunningham Realty, Ltd., 50 Broadway in Hawthorne, NY, through July 2007. The Tobey exhibition, one of the first in an ongoing series of art shows being presented by Cunningham, is being co-sponsored by a number of Westchester banking, real estate, art and other county businesses. Patricia Cunningham, president of Cunningham Realty Ltd., who is responsible for creating the gallery in their offices, said that her new office suite space reflect values beyond "business as usual". Cunningham notes that "just as our clients want spaces which reflect their values, we wanted an office suite which reflects ours. Art enhances our lives, stimulates our minds and can bring out the best in people. I wanted my professional team to have an attractive, energizing work environment. In addition, using our more than 150 running feet of wall space to promote artists helps the artists, enriches the community and provides a stimulating space for our clients and other visitors." Art Jay, Marketing Director, adds, "What we are doing here is not that far removed from what the major families and guilds of Florence, Italy were doing back in the Renaissance. We're just reviving a tradition established long ago. David Tobey's work soars in the space and has generated a great deal of comment and interest, even before the official opening." Artist David Tobey studied painting in his early years with his late father, Alton S. Tobey, whose paintings are in major museums throughout the country, but who is best known here for his historical Roots of Westchester Mural at the County Court House in White Plains. In addition to being a professional violinist and graduate of The Juilliard School of Music, David holds an MFA in Studio Art from the College of New Rochelle where he resides, teaches, and is a regular member of Pleiades Gallery in New York City, where he will be having his next one-man New York City show in the fall of 2007. His art has been published on the album cover "First Flight" by Oren Fader, on posters at New York's Lincoln Center and his work is in the collection of the George Bush Library. He has published his art as prints with Scafa, Modern Art and Ray Greenberg Art Publishing, and he has had many one-man and group shows in New York, Westchester and Connecticut. He describes his work, in his own words as: "exploring the aesthetic between visual abstraction and music ... and exploring energy and rhythm with a strict eye on the structured whole." 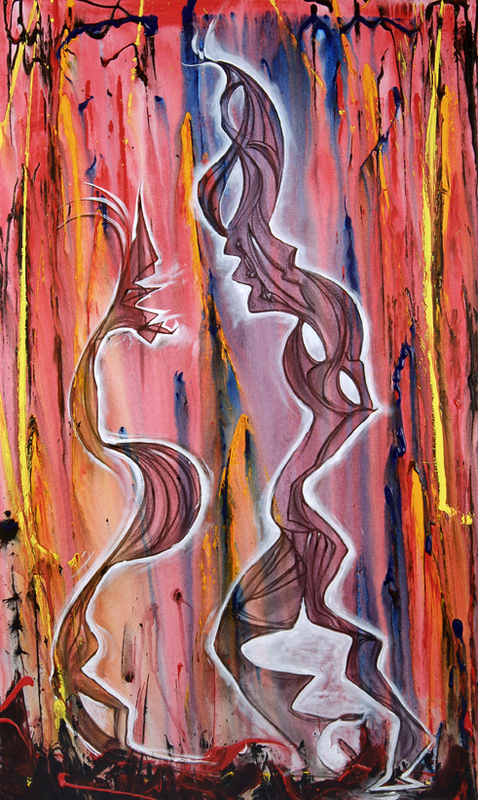 A 2003 magazine review of his first one-man show in New York City describes his painting: "He rides the rhythms in his canvases and reigns them in, much as a composer controls the ebb and flow of a symphony as it is coaxed into being. As with any piece of music, this involves a synthesis of spontaneity and restraint, as he works and reworks the composition, balancing its various elements until they coalesce in a dynamic chromatic and formal fusion". The opening reception for the exhibition will be held on Tuesday evening, June 19th from 5:30 to 8:30 at The Gallery at Cunningham, 50 Broadway, Hawthorne, NY, and all are cordially invited. Refreshments will be served and entertainment will be provided by the Kirk Ehrenreich Duo and catered by Antonees - Corporate Catering of White Plains. 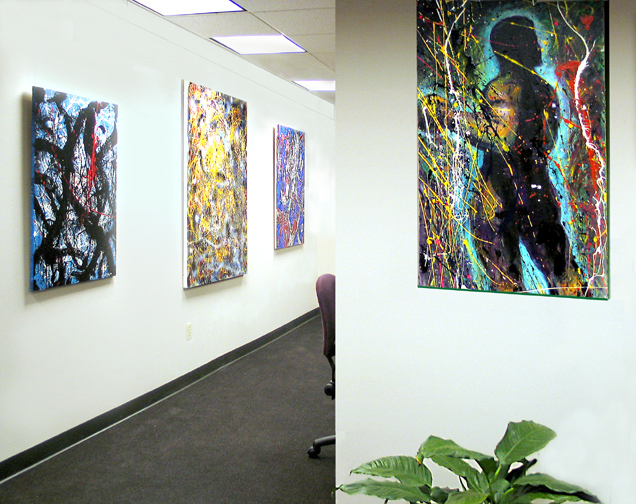 For more information, call the gallery at 914.741.4010 or visit the David Tobey web site at http://www.davidtobey.com. The Gallery at Cunningham Realty, Ltd.
A view of The GalleryAnother photo of the gallery shows a number of David Tobey's paintings and sculptures in the exhibition. A view of the galleryTobey's painting "Boxer" seen on a foreground wall with other paintings in the exhibition. David Tobey's "Knight on Horseback" 2007. 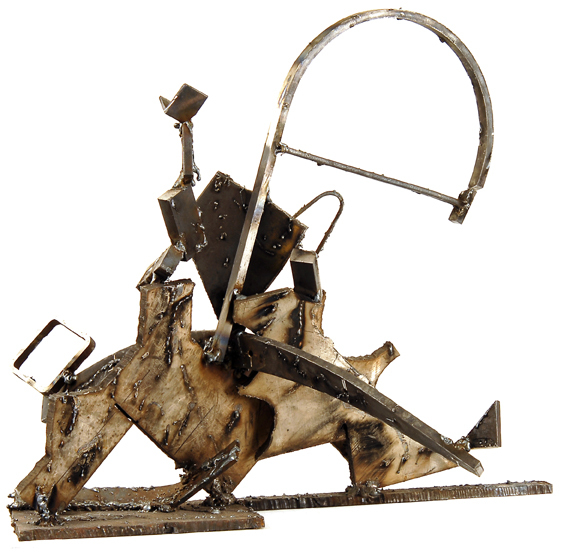 One of a number of David Tobey's welded steel sculptures in the Cunningham exhibition June 19th - July 31, 2007. David Tobey's "David and Goliath", 2007One of David Tobey's acrylic paintings in the exhibition at Cunningham June 19 - July 31, 2007. 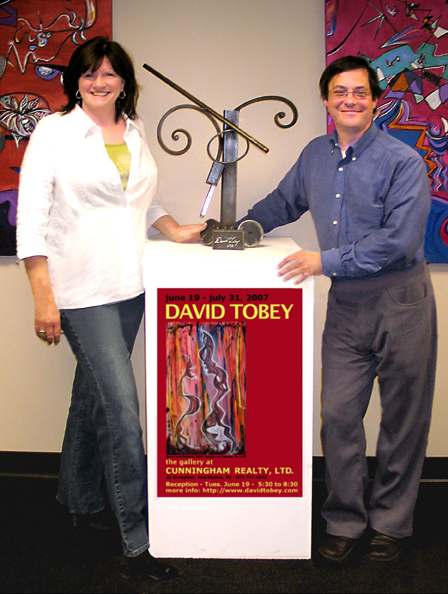 Patti Cunningham & DavidTobeyPatti Cunningham, president of The Gallery at Cunningham with David Tobey, the artist seen with David's welded steel sculpture "Podium", the poster for the exhibition and two of his acrylic paintings in the background. An Interview With Cunningham About Their New Gallery SpaceSome comments by Patti Cunningham and Art Jay of Cunningham Realty, Ltd. about why they opened the gallery in their offices. About the ArtistA short bio of David Tobey, some of his own observations on his work, and a listing of his exhibitions, works in collections and some of his other accomlishments as an artist.